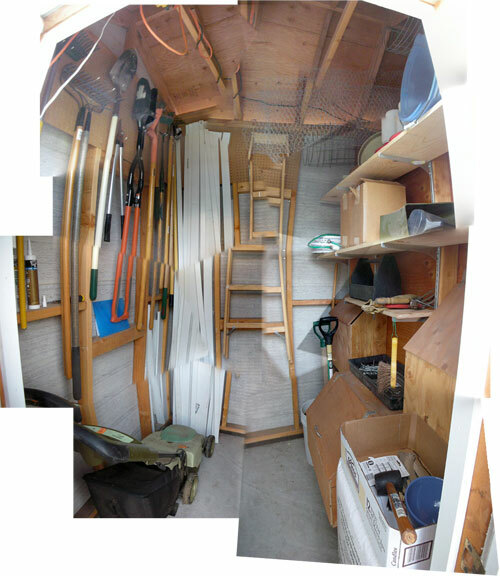 This morning we got the tools all hung up and the shelves cut and installed, and now the inside of the shed is really quite workable. I celebrated by grabbing the pitchfork and shoving the leaves back on the compost pile from the places where the chickens had kicked them. That feels all nice and orderly. When you add to that the little midnight project we did last night (because we know how to party), in which we added some shelves to former Roomie John's old wardrobe that he left us, making a nice linen cupboard and a place to store some office supplies, AND the fact that said former Roomie John took away the last of his stuff from our dining room on Friday, we are full of all kinds of organizational goodness lately. In the afternoon we went to an open house nearby, at 1612 Minturn. This house is supposed to have been built in 1880, four years after ours, and it's also Italianate, which meant we'd get some clues from it about missing details, assuming there are any details left. The first thing we noticed was that it needs a new foundation. 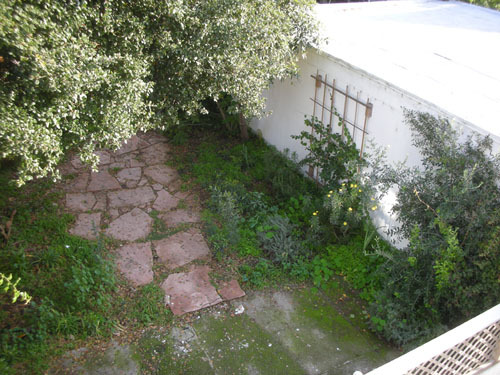 This is the basement, viewed from the back yard. You can see the capped original foundation, and a brick (brick?) cripple wall above it. Capped foundations are seismically inferior to replacements. And brick anything where you are connecting to the ground is a bad idea here. A better look at those cripple walls. The other think to note about the basement is that everything there has very recently been sprayed with white paint. What this, and the damp carpet pieces on the floor, and the piles of damp, moldy cardboard stuck to the floor, are saying to me is that this basement had a serious mold problem very recently. Now, you can clean that sort of thing up, and the paint will probably help keep it down, but there's clearly a moisture problem down there. 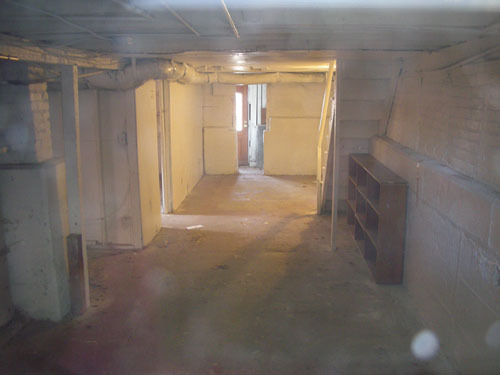 Given the basement, there would be no way I would buy the house unless the upstairs was just reeking of original charm. Let's just say that this fireplace says it all. That's the original. 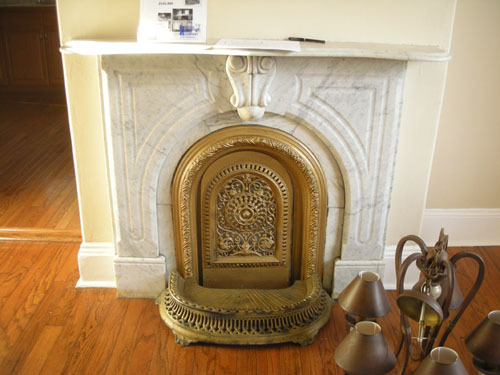 A coal grate, marble mantel. Mysteriously painted... gold? Black would be more original, to hide the coal dust. At least the new owners can paint it, right? On the other hand, it goes to show that my idea of what our mantel would have looked like was dead on. And you can still buy this mantel style. Yay. 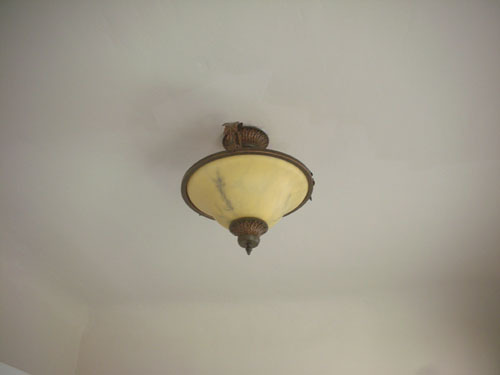 And all the light fixtures were equally out of place. Even if you could handle all the weirdly relocated walls (scootched over by two inches? WTF?) and widened doorways and the vinyl accordion closet doors, you'd have to cope with the fact that somebody saw fit to put these monstrously large Italian-style fixtures (clearly a misunderstanding of the Italianate concept) all over the place. Ugh. Well, there's a back yard, and the long side faces South. It might be decent, right? That'd be nope. Somebody else's garage blocks the only Southern light, and a massive (read: you need a permit to get it trimmed much less to remove it) live oak takes care of any other light that might have gotten down there. And then there's the crazy patios and the planting beds that are not so much planted as overgrown with weeds. It's a rough housing market. I'm glad we're not trying to sell right now. But I'm also glad the previous owners at our place didn't make a real mess of it. 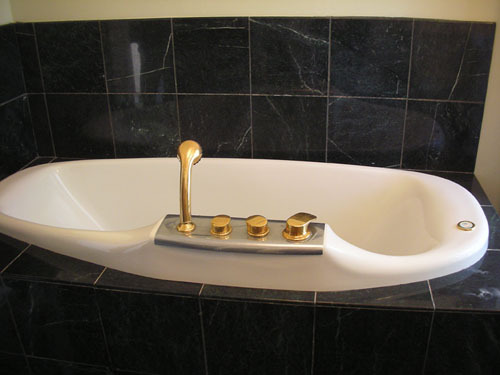 I'm especially glad I don't have to face that gold faucet every morning. 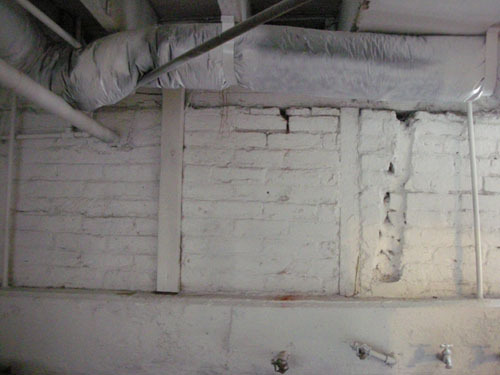 You need a dehumidifier in your basment. No, Russ. I do not need a dehumidifier in my basement. And as for the basement of THIS house, which is NOT mine, trying to address the water problem with a dehumidifier would be futile. What is needs is a water barrier of some sort on the exterior of the foundation walls, and perimeter drainage with an outlet to the street, which, done properly, would be on a replacement foundation rather than the one they have (since it's still on brick). A dehumidifier would be a waste of money and time.